Upon joining the Dogfish Head family, Executive Chef Lou Ortiz brought with him the ‘Rules of Spork’ – a check list of sorts that inspires co-workers to develop their off-centered food ideas and explains to them what their creations must possess in order to make it onto the menu. Does the dish fit Dogfish Head’s culture and vibe? Does the dish relate to one of our beers or spirits? Does the dish tell a compelling story? Is the dish sustainable and responsible? Does the dish allow us to maintain menu and station balance? Has the dish been tested and what was the feedback? The ‘Rules of Spork’ encourage our co-workers to continuously question everything about our menu – from the way a dish is made to how it’s titled. This sense of curiosity has not only helped us to streamline our culinary processes and enhance our offerings, but it has also allowed us to recognize and reinforce all of the awesomeness that’s already happening in the back of house. For example, all of the ingredients we make in house are from scratch! Each of our turkey burgers is hand-packed with at least 8 oz. of freshly-ground turkey. We make all of our pizza dough and sauce from scratch. 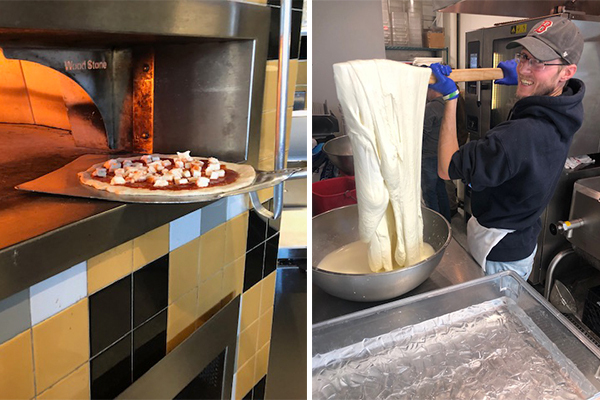 We brine and cure our pastrami in-house AND we make our own house-made mozzarella cheese to top our wood-fired pizzas and wood-grilled burgers! While the items on our menu may evolve, we guarantee these efforts will not waver, nor will our commitment to fresh, high-quality food. If anything, our ‘Rules of Spork’ will help us further embrace and celebrate our off-centered menu, as well as the co-workers and practices that bring it to life! Brewings & Eats is open for business Sunday through Thursday from 11 a.m. to 11 p.m., and Friday and Saturday from 11 a.m. to 1 a.m. To check out our full menu, come on by – or click HERE!